Today, the Israeli occupation army committed a new massacre in Gaza, causing the death and injury of hundreds of Palestinian civilians, including a yet unknown number of school children who were headed home from school when the first Israeli military strikes started. Occupied Ramallah, Palestine - 27 December 2008: Today, the Israeli occupation army committed a new massacre in Gaza, causing the death and injury of hundreds of Palestinian civilians, including a yet unknown number of school children who were headed home from school when the first Israeli military strikes started. 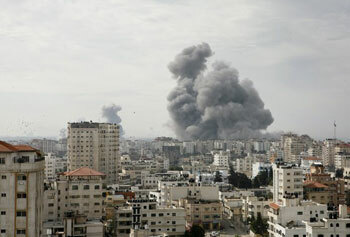 This latest bloodbath, although far more ruthless than all its predecessors, is not Israel’s first. It culminates months of an Israeli siege of Gaza that should be widely condemned and prosecuted as an act of genocide against the 1.5 million Palestinians in the occupied coastal strip. Israel seems intent to mark the end of its 60th year of existence the same way it has established itself – perpetrating massacres against the Palestinian people. In 1948, the majority of the indigenous Palestinian people were ethnically cleansed from their homes and land, partly through massacres like Deir Yassin; today, the Palestinians in Gaza, most of whom are refugees, do not even have the choice to seek refuge elsewhere. Incarcerated behind ghetto walls and brought to the brink of starvation by the siege, they are easy targets for Israel’s indiscriminate bombing. While the US government has consistently sponsored, bankrolled and protected from international censure Israel’s apartheid and colonial policies against the indigenous people of Palestine, the EU was able in the past to advocate a semblance of respect for international law and universal human rights. That distinction effectively ended on December 9th, when the EU Council decided unanimously to reward Israel’s criminal disregard of international law by upgrading the EU-Israel Association Agreement. Israel clearly understood from this decision that the EU condones its actions against the Palestinians under its occupation. Palestinian civil society also got the message: the EU governments have become no less complicit in Israel’s war crimes than their US counterpart.